Aptamil Feed Thickener is a thickening agent and may be mixed with breast milk or infant formula to assist in the management of regurgitation. Aptamil Feed Thickener may also be used to thicken the fluids and foods of infants, children and adults. In all cases it should only be used under medical supervision. This product is not an infant formula, breast milk substitute or a complete food for infants. Aptamil Feed Thickener is a tasteless and odourless food thickening agent. To be used to thicken liquids or food but not as a sole source of nutrition. Not suitable for use with premature infants. For breastfed infants: Aptamil Feed Thickener can be mixed with a small amount of cool boiled water or expressed breast milk and fed as a gel before, during or directly after the breast feed. Alternatively, it can be mixed with expressed breast milk to thicken the feed. 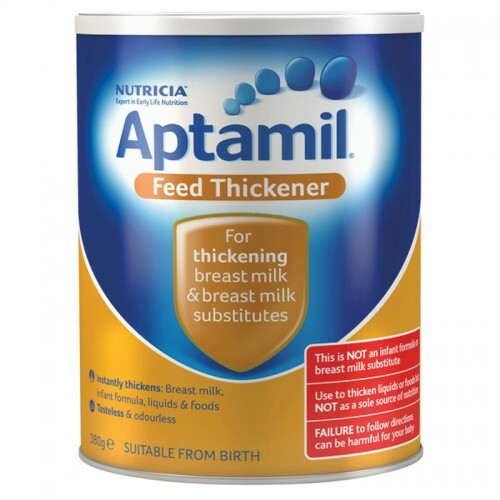 For formula fed infants: Aptamil Feed Thickener can be used to thicken standard infant formula, or special formulas. If a baby on standard formula requires a thickened feed, Aptamil AR Thickened Infant Formula, which already contains thickener is recommended. Aptamil Feed Thickener is not suitable for general use and should be used under medical supervision. This product is not an infant formula or complete food for infants.